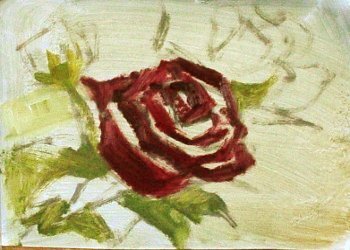 Do you find the thought of learning how to paint roses a bit daunting? All those petals and subtle shades of color! 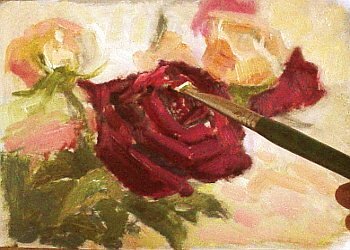 On this page I'll use a step-by-step oil painting demonstration to show you that the process of how to paint roses is very doable. The same procedure work with acrylics, too. I took this picture of some roses on a beautiful summer day in my kitchen. I like the soft glow of the roses and the variety of colors. The focal point is obviously the deep red rose in the middle. My intention here is to create a quick oil study that will convey a sense of spontaneity and freshness. I want to give the viewer an impression, but avoid overworking the canvas. Let's started to learn how to paint roses together. First, I prepare two copies of the main image. In one, I used image processing software to blur the picture. Squinting at a subject is a great way to spot the main shapes and tones, but it gets tiring. A blurred image allows me to do the same thing without getting a headache. Once I have the painting blocked in correctly, I find that details are either easier to paint or not necessary. The second copy is a gray scale version, which helps me see the tones I need to mix for different parts. Tones are a compass that guides the mixing of colors, because everything will be tied together by tonal relationships. If the tones are right, the painting looks unified. I use a gessoed 6”x 8” (15cm x 20 cm) mat board. I have three bristle filbert brushes (ranging from number 6 to 4) plus a small round number 1 brush for sketching and details. My color palette consists of 4 water soluble oil colors: cadmium yellow medium, cadmium orange, alizarin crimson, and ultramarine blue (plus titanium white). I limit my time to 20 minutes. I find that the less time I have, the less likely I am to fuss around, and the result is a stronger painting. It's a technique I learned from Craig Nelson. 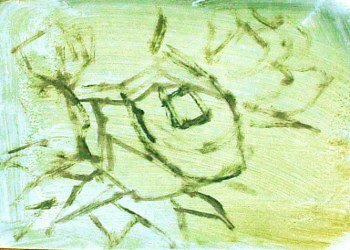 First, using the blurred image, I sketch the composition—editing out the details and smaller shapes. Even with the blurred image, I squint so I can narrow the tones down to just a few. It is important early on to catch the “thrust” (or “gesture”) of the roses. For now, I treat them as cylinders, and only depict the largest dark “crevasses” to indicate where things are going. I don't dwell on the details. 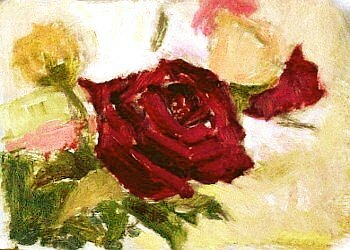 Once the sketch is satisfactory, I use the largest brush to paint the center of interest: the large rose in the middle. The strokes are bold...even a bit sloppy. I mix ultramarine blue into alizarin crimson for the dark tone and adjust it by adding more alizarin crimson for middle tones. 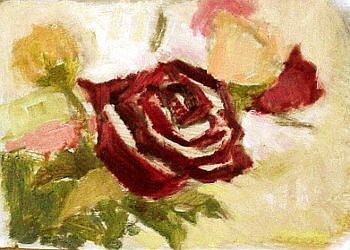 Note that this is the more crucial stage of learning how to paint roses - initial differentiation of large masses with the correct color notes. I continue to cover the large masses with different flat colors. I am still squinting to keep me from getting lost in details. 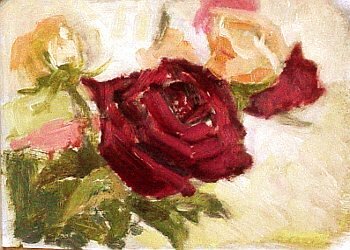 The objective is still to create approximate shapes—an impression of the roses. Once the flat tones and large masses are laid down, I start to mix tonal variations to create more depth. I compare the new tones with the previous ones to keep the all-important tonal balance. I add some of the brightest tone to the roses in the background. 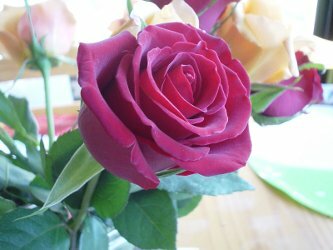 As you learn how to paint roses, remember that the basic shape of a rose is cylindrical, and lighting will affect them accordingly. Here, the light is coming from the right side. Using my smallest brush for added control, I paint the highlight on the middle rose. Because roses have a velvet-like matte surface, the highlight should be soft—not shiny. The final stage of the painting is edge control. I want to make “soft” edges recede and to sharp edges come forward. Laying down blocks of color with the big brush, as I did earlier, is likely to leave a lot of harsh edges. They may be either where two shapes connect or where planes meet within the same shape. I use a clean brush (or my finger) to soften the edges of the top left rose and also the rose at the top right corner. I also soften the furthest petals of the middle rose to keep the focus on the sharp center of the large rose. 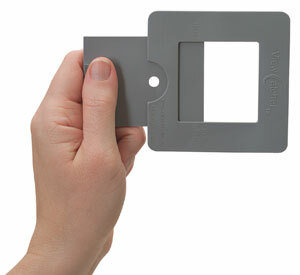 Soft and hard edges both have their place in achieving strong visual impact. I notice that the red rose in the middle is in danger of being overworked. So I stop. I often do this kind of small, quick oil study to prepare for larger paintings. It is like a trial run before a long marathon. When I tackle the larger format, I have already practiced the brushstrokes and worked out the composition. It really smooths the process. There are other benefits to this type of painting. Click here to learn why quick oil/acrylic studies will advance your painting skills. Practice painting all the roses in front of you. Remember that artists are made, not born. 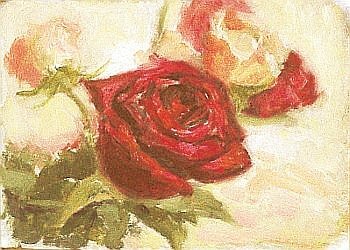 You can learn how to paint roses, too! Frame every subject for better composition!